There was a time when people used to carry heavy notebooks packed up in bags and briefcases just for the sake of noting down the important points/notes, whenever they wanted to attend a meeting or some other important event. The arrival of Laptop and Notebook PCs definitely minimized this use of notebooks, but that wasn’t enough as carrying a laptop everywhere still seems quite hard. Another fear that you probably always had on your mind was losing the important documents you made your notes on, what will you actually do if you just lose em’. What has actually minimized the use of Laptops and Notebook PCs is Android. Android smartphones/tablets are used all around the world, and getting an Android-powered device isn’t hard at all as you can find one easily on an affordable budget. Carrying the Android smartphones and tablets is even easier, so you don’t always need to bring your big bags, notebooks or some other stuff to take notes, an Android device will always do this job on the go, but to take notes on your Android smartphone or tablet, you will definitely need an application, and probably you will look out for the application that performs this task at its best. While going through the Google Play Store, I came across a number of note-taking apps, but it was hard to go with the best one. Before you go through the same confusion, I’ve picked up the 5 best and free applications that can help you to take the notes being convenient. Let’s move forward and go through this list. droid. It is loaded with tons of features which make it a lot easier for you to take and save your notes and share them on the go. The Evernote offers the users to add pictures to the notes, voice recording option is there that makes it even easier for you to remember and remind yourself anything. It also allows the users to add sketches and handwriting to the notes. Evernote is available for different platforms e.g Windows and others. 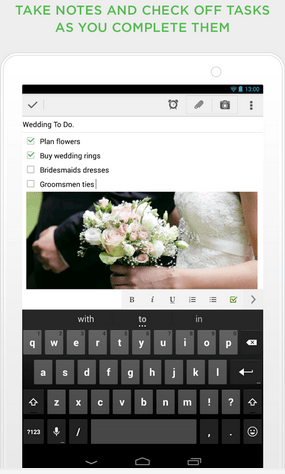 Once you install it on your Android device, you can sync your notes between all of your notes so, you don’t always need to transfer your notes or connect your device and you can access your notes across all of your devices without any hiccups here and there. 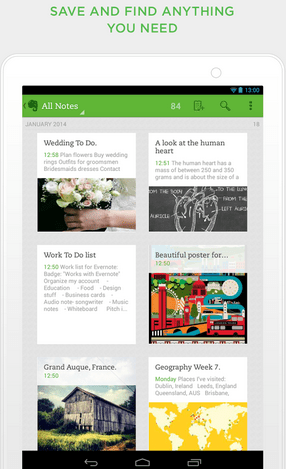 Evernote’s feature list is quite long, we recommend you to install this application and check out everything it has to offer that enhances the note taking experience on your Android smartphone or a tablet device. The application is available for free in the Google Play Store, but also offers some premium features that you may purchase if you wish. Grab it from Google Play Store for free or download it for your Windows PC. Google Keep by Google, obviously doesn’t need much explanation for standing at the number 2 spot in our list. 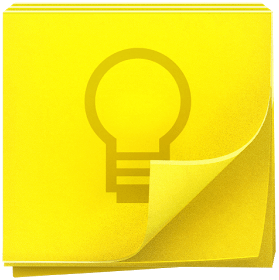 The Google Keep is quite similar to Evernote but is less complex and simplistic. Google Keep prompts the users to quickly note what’s on their mind, quickly record what they are gonna speak so that they never forget, and quickly capture what’s tinkering with their eyes. You can make your notes colorful and set a reminder based on location or time in order to get your task done on time, and yeah you can definitely add sticky notes to your device’s home screen using the widgets as well. The Google Keep is also available for multiple platforms that helps you sync between all of your devices using one Google account. Google Keep helps you to keep your notes organized so that you don’t have to face any problems while looking for your important notes in your device. Google Keep is absolutely free, go ahead and grab it from the Google Play or download it for other devices from here. ColorNotes by Notes is way simple. The application isn’t loaded with a hefty list of features that help it to remain simple and easier to use. ColorNote offers the users to quickly note down the important points, emails, memos and make to-do lists and sort them by colors. 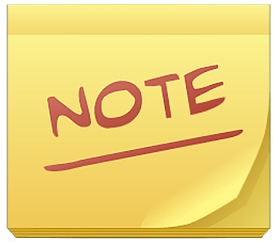 Another cool feature this application has is the password protection for your important notes and the online and offline backup system that helps to keep the notes as safe as possible. Sticky note widget is also there that will help you to remember your important stuff by staying at your device’s home screen as long as you do not delete it by yourself. Like the Evernote and Google Keep, ColorNotes also offers to put powerful reminders so that you don’t miss something important. You can install ColorNotes form the Google Play Store for free, and there are no in-app purchases. 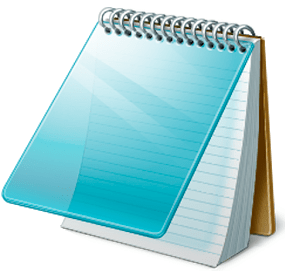 Inkpad Notepad is much similar to the ColorNotes but lacks a number of features that you may want to have in a note taking applications. The Inkpad Notepad offers the users to create notes, to-do lists, shopping lists and save them right away without taking any special actions as everything you write is saved automatically. You can sync your notes online, and there’s a backup option as well that saves your notes to your phone’s SD card. Inkpad Notepad’s free version if ad-supported, while the paid one doesn’t have any advertisements. Grab it from the Google Play Store for free. 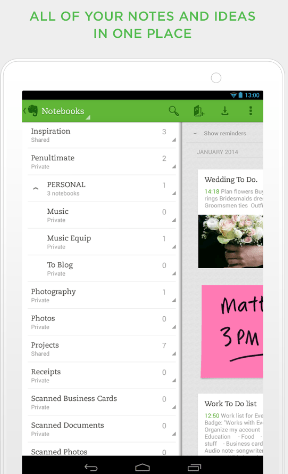 Last, in our list, Fast Notepad happens to the simplest and lightest note-taking applications on the Google Play Store. Doesn’t contain any special or extra features, the application is exactly as the name suggests, fast to take the notes. Simply create your notes, save em and share em’ on the go. Because of the application’s in complex UI and features, I actually liked it and installed for myself. Just go ahead and install this 351KB application on your Android device for free from the Google Play. That’s all. We hope that these applications prove out to be of some help for you. You will only forget your notes as long as you forget your Android device somewhere, so taking notes on Android is actually beneficial in all the ways. In case you think that this list is missing something more useful, feel free to mention in the comment box below and we will have a look on that for sure. Thank you all.